On a walk in the woods the other day, I found what I was looking for: a leaf! 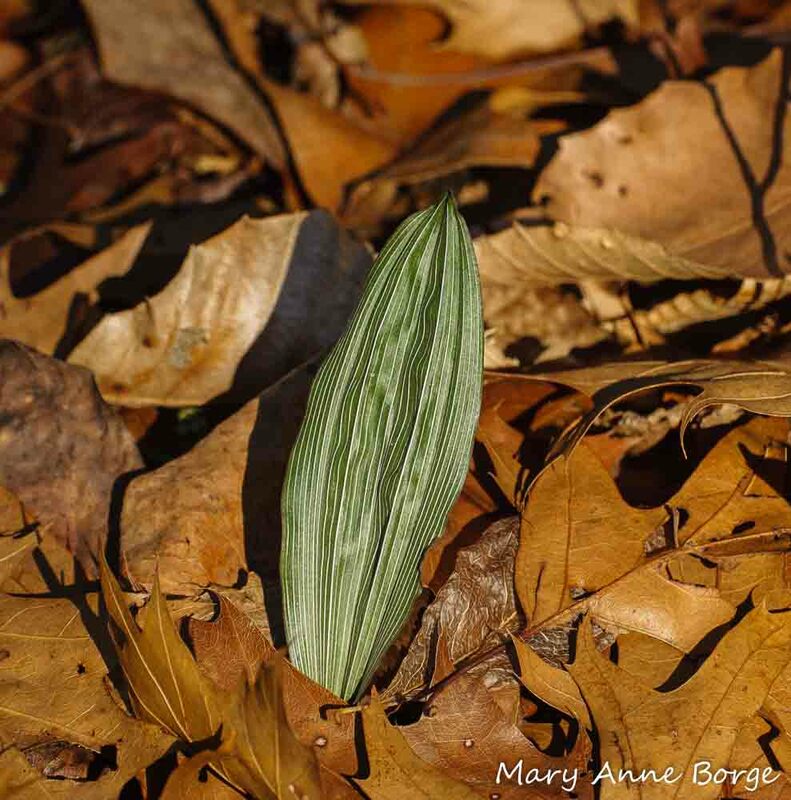 It may seem like it should be pretty easy to find a leaf on the forest floor, but I was looking for something very specific, not a fallen leaf, but the newly unfurled leaf of a native orchid called Puttyroot (Aplectrum hyemale). ‘Hyemale’ means winter, a reference to the fact that the leaves of this plant emerge in late November or December and are visible until spring. Puttyroot is found in rich deciduous woodlands, often in the company of Sugar Maple (Acer saccharum) and American Beech (Fagus grandifolia). It gathers its energy from the sun during the months when the forest canopy is open, while the leaves are off the trees. Photosynthesis occurs in this plant at temperatures as low as 35ºF (2ºC). During this time, Puttyroot also benefits from the nutrients released to the soil from the blanket of decomposing leaves from the neighboring trees. 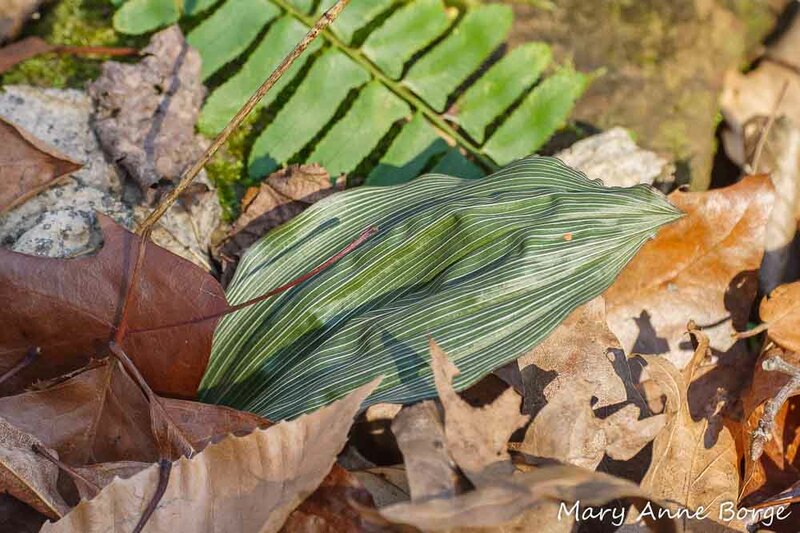 In ideal conditions, Puttyroot sends up a single striped, accordion-pleated leaf in late fall, about 3-8 inches (.75 – 2 dm) long and 1-3 inches (.25 – .75 dm) wide. The leaf dies back by the time the single flower stalk blooms in May or early June. The flower stalk height can vary from about 6 to 20 inches (1.5 – 5 dm). Bees are likely the pollinators of Puttyroot, although the flowers can also self-fertilize if necessary. Puttyroot’s many tiny seeds are dispersed by the wind. There may be years when a Puttyroot plant doesn’t bloom, its presence only revealed by the winter leaf. Some years the plant may be completely dormant, without even the leaf visible above ground. 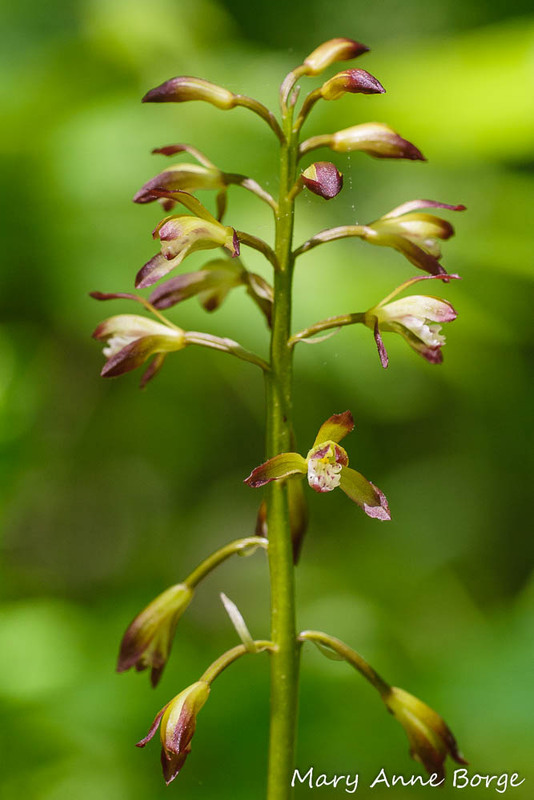 This orchid species is native throughout the eastern half of the United States (except Florida) and in Quebec and Ontario provinces in Canada, but it is listed as rare, threatened or endangered throughout much of its range, including New York, New Jersey, Pennsylvania, Vermont and Massachusetts. Non-native, invasive plants like Garlic Mustard (Alliaria petiolata) and Japanese Stiltgrass (Microstegium vimineum) are a serious threat to Puttyroot and its companion woodland plants. Not only do these invasive species compete for resources with native plants, they also alter the soil chemistry in a negative way, interfering with the mycorrhizal fungi that is present. Most plants don’t get the nutrients they need directly from the soil, but rather through a partnership with mycorrhizal fungi. Plants provide sugars to the fungi, and the fungi in turn make nutrients available to the plants. If the fungi aren’t present, the plants won’t get the nutrients necessary to continue to be viable. The good news is that both Garlic Mustard and Japanese Stiltgrass are easy to remove by pulling. Garlic Mustard is edible, so you can reward yourself for removing it by eating your ‘harvest’. Garlic Mustard pesto, anyone? Early settlers used a mucilaginous substance obtained from Puttyroot’s corms (part of the underground food storage system) to repair broken pottery, a practice that resulted in the plant’s common name. Another common name, Adam and Eve, also refers to the plant’s corms, which are usually paired. Go for a walk in the woods and see if you can find a Puttyroot leaf. If you’re successful, make a mental note of its location. 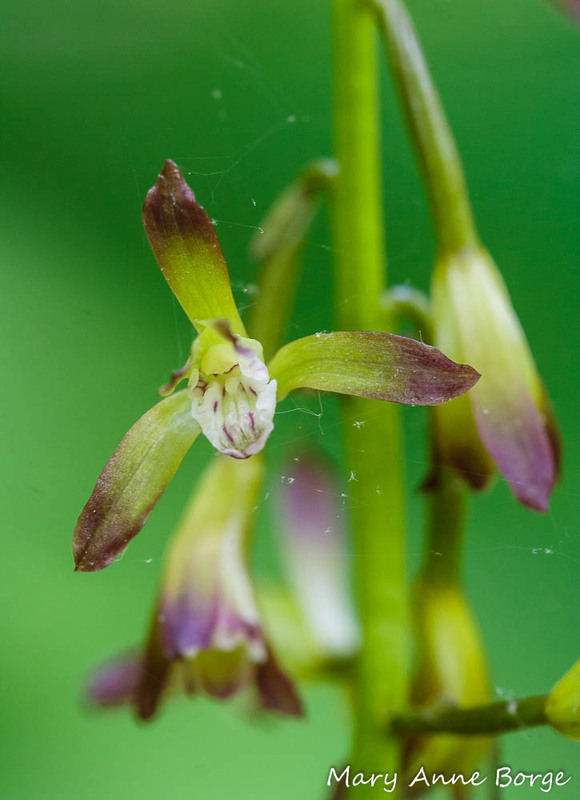 Then visit the spot again in May or June, to see if you can find the flower stalk in bloom. Repeat the process until you find this buried treasure!